Heroes, Heroines, and History: How Much Did That Artifact Bring? How Much Did That Artifact Bring? As a lover of many things historical, I tend to gravitate toward TV shows that portray old objects being unearthed, restored, or sold as found. 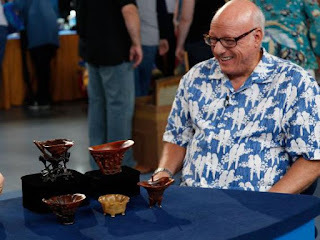 Whether it be Pawn Stars, American Pickers, sunken treasure recovery shows, or something like Antiques Roadshow, I enjoy them all--even some of the Barrett Jackson auto auctions that often feature cars and trucks older than I am. Yep, they do exist. I've like episodes of Fixer Upper (home restoration) as I love seeing a person or couple choose a hundred-year-old house to purchase and have restored. There are many treasures hiding across America waiting to be found in someone's barn, attic, basement, or field, that often they don't even realize they possess. I thought it would be fun to share a few finds over the years that made news or gained attention on one of those shows. In July 2011, on Antiques Roadshow a man from Oklahoma broke the Antiques Roadshow record with his collection of Chinese cups carved from rhinoceros horns. His collection dates back to the 18th century, and was appraised by Lark Mason for $1-$1.5 million at auction. The episode aired in January 2012. Watch the appraisal here. This sword is embellished with gold and saw action in battle in early 1880s. After the battle, the sword reached Napoleon’s brother hands, as a wedding gift. It was declared a French national treasure (1978). Also, it was auctioned in France for $6.4 million. It stands as a symbol of victory, power and strategy! Jim Younger's "Fiddle" Played by Him at the Famous 1898 Christmas Party at Stillwater Prison. Of all the significant relics in the Wilbur Zink collection, this violin is perhaps the most evocative. Cora McNeil, who served as the Younger brothers' unofficial secretary while they were incarcerated, was present at the December 25, 1898, party for the inmates held at the home of Warden Wolfer. The tree was decorated with ornaments made by the inmates, and Cole Younger himself was dressed as Santa. Cora was accompanied to the party by her nine year old daughter Edwynne. It is widely believed that Cora was at one time Jim Younger's mistress, and quite possibly Jim was Edwynne's father. In any case, "Uncle Jim," as she called him, obviously held her in special regard. His violin was under the tree as a present for little Edwynne. In 1968 Edwynne Neill Deane, still alive, penned a handwritten account of the event, and that account, along with a typed and notarized version, accompanies this lot. The violin is expected to bring at least $10,000. Quantrill Guerilla, a paramilitary force that waged war against the Union army during the final days of the US Civil War. 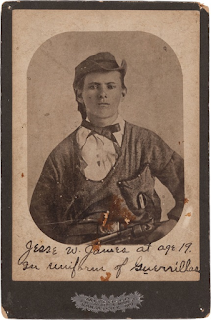 James was fiercely pro-Slavery, and his later criminal exploits were hailed as heroic by former Confederates in the South. Sold at Heritage Auctions in 2013 for $7,170. What's the most interesting historical artifact or 'treasure' you've discovered? 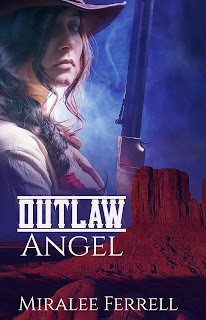 On the run from a dangerous outlaw, Angel works her way across several states disguised as a boy and working as a varmint tracker and horse wrangler. 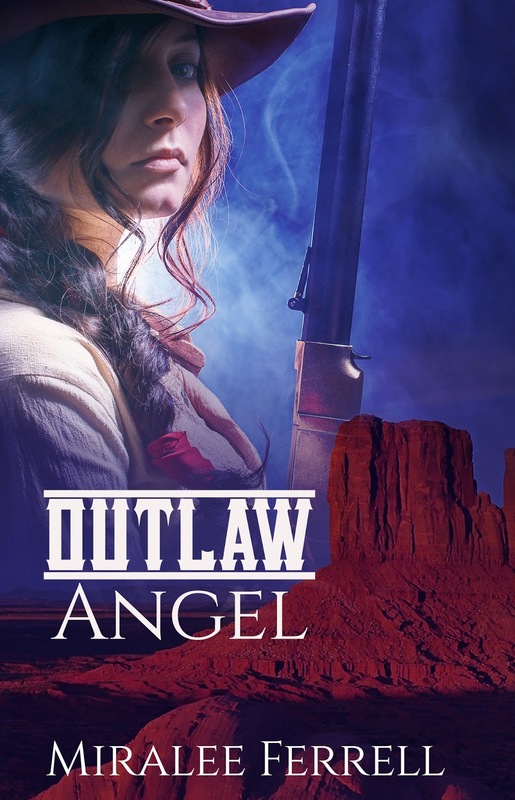 After taking a job on a Wyoming ranch owned by a bachelor and his widowed sister, she finally reveals her true identity and must fight to prove her worth as a ranch hand while somehow discovering her role as woman. credit and another releasing this year. She lives in Washington state with her husband, two dogs, 2 cats, and 14 chickens, and loves traveling to various places for historical research. 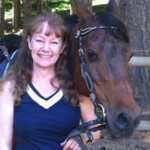 You can connect with Miralee, learn more about her books, and sign up for her newsletter at her website, or join her author group on Facebook. My hubby and I used to watch those shows all the time. It always amazed me to see how much money some of those items were worth. This was an interesting post. Thanks for sharing. Interesting! My husband and I live in an 1850 home in NH. While renovating the carriage house we found Boston Globe newspapers from the 1920s that had been used as insulation. One of them had a front page article about the death of Charlie Chaplin's mother. Probably not too valuable, but fun to find nonetheless. Great post about artifacts. Our dad was an auctioneer so he discovered some amazing artifacts when doing estate sales. A family member has an antique cabinet that was in a one room school house back in the early 1900's. I enjoyed this post, Miralee. I've done my share of auction and estate hunting but there's usually someone else with more knowledge and money to win the booty. Although it's not worth much, one of my best finds is a Currier & Ives print of Brook Trout Fishing - “An Anxious Moment” in its original frame. I paid $25 for it many years ago and don't think it'll fetch more than that, but I love that it's in an original frame and backing. So different from framing techniques today. I have a collection of antique typewriters and adding machines but as they're hard to display and clean, they're hidden away with my oil lanterns. Nothing expensive, but they give a hands-on sense of history. My husband and I really enjoy watching American Pickers. We are amazed at the items those guys find.